Here is a couple pictures of a project I am playing with. I think I have decided not to use the fins on the top on the next one I do. What sort of compression ratio are you shooting for? If it tests out OK are you thinking of selling them ? WOW, they look pretty good, a question though, can these be made to take a domed piston too or is water jacket heights going to be to restricted ?? I like the way the Z heads perform but I would much rather have an Iron head. 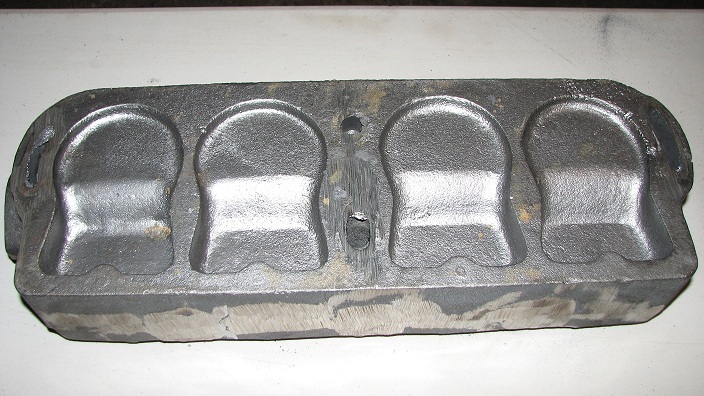 I tour a lot and it seems that if some one on a tour has head gasket issues, it is from an aluminum head? The price of the Big Giants, Shermans, Waukashas are getting up there so high that the average T guy can't afford one. I am going to try to make a dozen of them, half of them will be for close friends that are helping me with this project and the other half will find a new home. If it works out there may be more of them made. This one will get machined but probably cut up to see where I can lighten it up. Right now there is about 7/8 in. above the piston area, that was an area I was thinking of changing the core on. ive been threatening to do this for some time now! awsome to see someone doing it. who is doing the pouring? and could you also post some pics of the patterns and core boxes? ive been really interested in making heads for ts and as. its always nice to see how others do things. btw i think the fins would be great! but they need some beefing up so they will fill better. My day job has a foundry as part of it's business, they make Industrial chain, they even sold the chain to Ford that hauled the Model T's down the assembly line, it was called CC5, the chain is still used in the auto industry. There is an older foundry boy that has been helping me and also a new young boss that is eager to learn in case we have to make a complicated pattern as this. I am running a Giant Power Head in my 13 touring and am pleased on how well it performs. 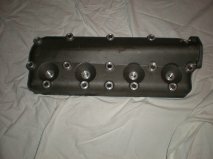 Also have a very good W/R cast iron head that is not being used that I would sell for $450.00. If someone is interested, please contact me off line. I also like running a cast iron head vice aluminum. The Giant and W/R heads are taller than a stock high head and hold more coolant. Why stop at a dozen? Although I like the Finns (Finnish), I don't care for fins much on model Ts. A few after-market accessories were available in the T era that had fins. But they are so rarely seen, that fins in general just do not look era to me. Adding fins to engine parts is more of a Hot-Rodder era thing. And before everyone starts posting engine photos of Bugatti, Stutz and Marmon et al, yes, I have seen them. But they are not model Ts. 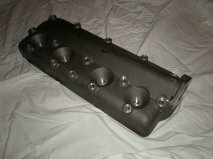 I am having head gasket problems with my H/C aluminum head also. It's coming to a point that I'm thinking of going with H/C pistons instead. I'm looking foward to your new non finned cast iron H/C head also. Keep us informed Joe. How thick is the metal above the piston? Mow much can be machined from the deck surface of the head? It kind of looks like it can be machined to virtually no clearance above the piston? Above the piston is 7/8 in. on the one that I cut up, so it would be ideal for any combustion chamber some one wanted to make. The top of the head is 1/4 with about 2 in. of water core. OK, so lots of metal for what I want to then!! Putting my own .02 where it wasn't ask, I think the fins can serve a useful purpose in the pour. Sure it can be cast without them and probably be fine, yet we all know that a few regular ones open up their strong-back after years of use because stresses were trapped in the pour. The fins would act like a sprue and draw up the iron to assure the topside has a place for the contracting stresses and shock of pour to pull up into...that's why the trial pour has the wavy surfaces on the fin tops...out-gases got stuck in the mold before the metal could flow. 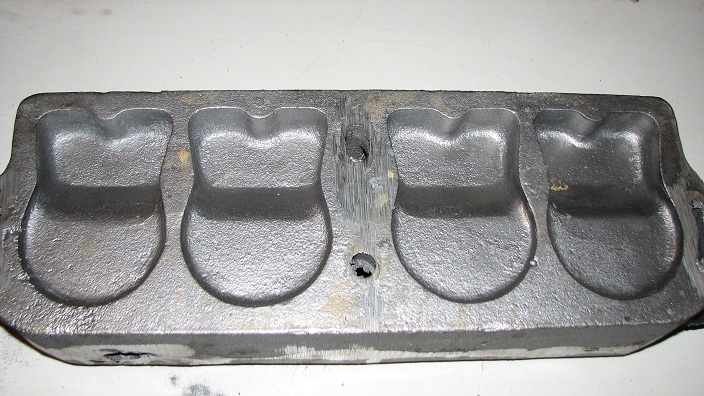 I'd be curious as to the orientation of the pattern in the pouring mold. Meaning was it poured flat or poured side vertical. I 'see' different bubbling from side to side on the fin tops and that can be corrected in a pour easy enough to actually make them uniform in height and draw. Ask your old foundryman if he keeps a straw broom handy If he doesn't, send me an email. George, I like your thought on the gases, I can always mill some of the fins down some to even them out or vent the top of the mold to fill in better. That is what is nice about this forum, plenty of experience is out there you just need to ask. I am going to guess that it was poured upside down (the fins on the bottom or "drag"). You can see where the vents have been ground off of the "deck" side. Consider that the core will float in the molten metal. They would have used "chaplets" to support the core while the metal was being poured. Probably more chaplets to help control the core float. I figure the fin "defects" are caused by a marginal filling gate or perhaps just a very slightly cool pour temperature. The fix that comes to mind is to bring the metal in from both sides at the same time as the fins are time as the fins are just fine on the side the metal was poured in from. I have to say, that the one and only time I got to pour pot metal was back in junior high, and it was quite a thrill making little things. i would buy a raw casting off you when you get one to come out ok. i am a pretty good machinist and would love to do it myself. The machining has started, the fins are now about 1/16 tall, they still show up well, now the fun part cutting in to the combustion chamber to make it what I want. We found out tonight that it will not fit on a 26-7 Tudor sedan with out cutting the firewall, so I guess it will get install on a truck first to see how it runs. 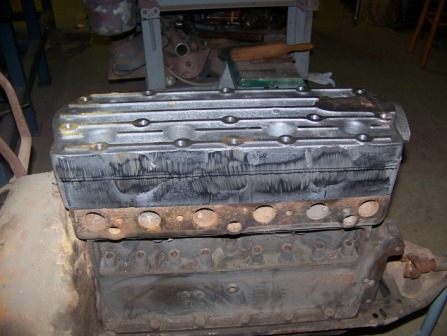 I have never had head gasket problems with an Aluminium Z head. However, two of us have had failures with Reader aluminium heads. 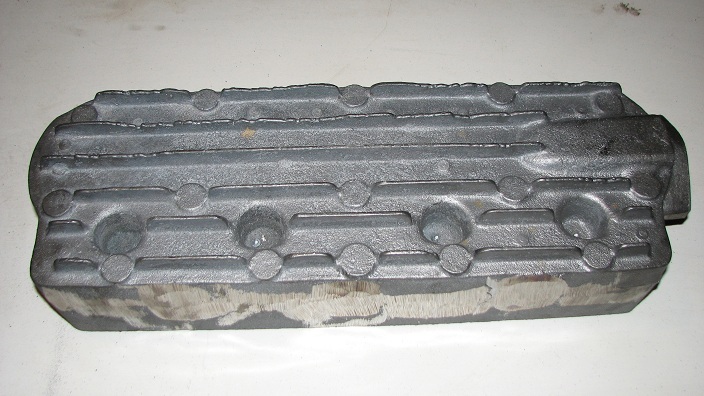 These have a large hole between cylinders 2 and 3 which has no corresponding hole in the block. Both heads failed here, warping and causing gasket leaks. We welded up the large hole and re-drilled the small hole to match the block, and have had no problems since. I have a waukasha head and after studying it, I decided to make the combustion chamber similar to it. Will post some pictures soon. Surely you ain't copying that feature? You need to look at Kevin Prus's Head He already has it in production, no rough edges, high compression and factory perfect. Is Kevin selling heads ? Details Please. 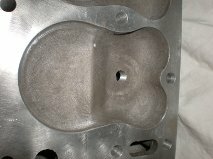 Back to the drawing board, started machining the spark plug holes and hit a water jacket. Now back to changing the core box and to lighten the pattern up. Hey, Mo -- I'm sure several of us would be interested in more info about Kevin's head. Is there a website where we can see (and/or buy) them? Do you know whether there is enough "meat" in the spark plug area to drill and re-tap them for Model T plugs? Just got off the phone with Kevin Prus. The heads are available in about four weeks & are made out of aluminum, weighs only 12 pounds. It should be possible to machine the spark plug threads to std pipe thread, but mr Prus choice to machine them to 14mm is because of the larger heat range of spark plugs available in the modern size. This makes sense for an 8:1 head, where the (by today's standards) extremely hot Champion X plugs likely wouldn't be the best choice anymore - something colder might be a better choice? I like the idea of reasonably higher compression than the Z head, so I ordered one. I hope you can find 14mm NON resister plugs. Resister plugs take quite a bit of the punch out of the spark hence the super high voltages that have been in common use. 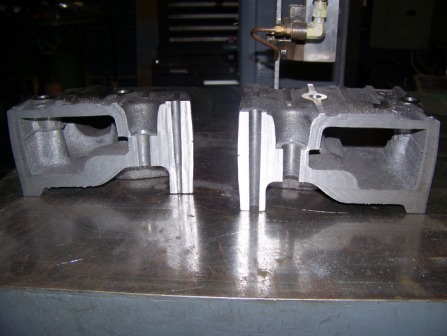 Here are some pictures of the iron high compression head. We cut it apart to look for any issues that need to be improved. Will be re-working the core for the next one. Can you show pictures or video of the core being assembled and the pouring? I can get some pictures of the cores and the core box, since it is at home right now to do some rework on it. As you see there is iron where I do not want it and needs some in other places. That is why we cut it apart to fix issues, one big one is the spark plug area and above the combustion chamber. I had a head just like that for years, only it was cast out of Aluminum, and on top of the casting where that empty space is by where the water outlet is, it had about 1 inch long, and 1/8 high letters cast in, said, hope I got it spelling right, INDOLA. I got the head from a Vender, I think Gas Light Auto. Nothing was Machined. I never did use it, and my boy sold it some where. I had it for at least 30 years. Fins, and all, the same thing. Herm. I don't have any sure answers, and I don't even know a lot of questions to ask, and I am impressed with the talents shown above. Mebbe all you guys are racers who won't give up all your secrets, or mebbe some of you aren't seeing the whole enchilada. Once the spark ignites that mixture, the flame travels outward at up to 1700 degrees in a flash. Bounding it is a cylinder of variable thickness that is cooled by oil that smokes at 300 degrees. The aluminum alloy piston with iron rings melts at mebbe 1100 degrees, and it's cooled by the same oil. Above the flame is an alloy or iron head that is the boundary between the flame and hot water. Too much heat conductance will quench the flame and maybe boil the water in spots. Too little conductance can result in melted parts and pre-ignition and dieseling. Add to that the compression ratio, lean or rich mixture, outside temperature and humidity, etc., and rate of cooling water flow. You then see why better engines use thermostats to reduce one big variable, the temperature of the water in the jackets. Don't feel bad if you don't get it right in your quest for an improved head, Ford did a pretty sloppy job of cooling balance, resulting in #1 running too cool too much of the time, and requiring super hot sparkplugs. Oh, another variable: a copper or steel head gasket. 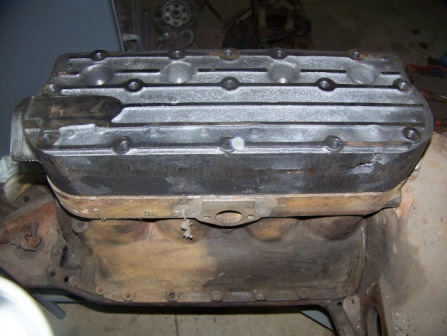 BTW, I believe stripped blocks and head gasket failures can be reduced with use of head studs in place of bolts. That's just my personal experience with the R Fronty.